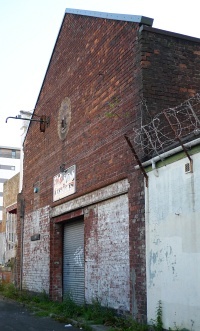 The Saracen Tool Works was an industrial complex spread across several streets near Glasgow Cross where Alex. Mathieson & Sons manufactured woodworking and engineering tools. It grew piecemeal during the late 19th and early 20th centuries. In 1896, John Honeyman & Keppie designed a four-storey addition at the corner of Great Dovehill and Bell Street (formerly known as Graeme Street). In 1902, Honeyman, Keppie & Mackintosh designed a wood-drying shed in Macfarlane Street and a founding shop in Saracen Lane. Authorship: One of the drawings approved by the Glasgow Dean of Guild Court showing ironwork for the Saracen Lane founding shop was signed by Mackintosh on behalf of the practice, but there is no evidence that he was involved in its design. Alternative names: Alexander Mathieson & Sons.